Turbidity barriers are also known as floating turbidity curtains, silt curtains, silt barriers or silt screens. They prevent the migration of silt and sediment from a work site into nearby waterways. 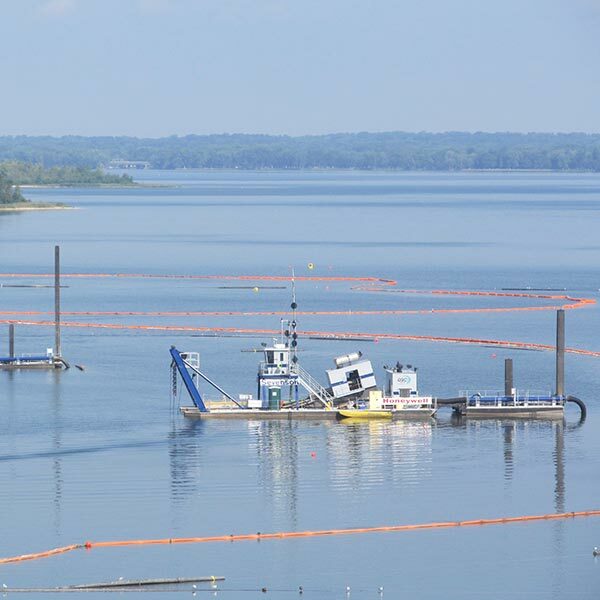 Applications include dredging, pile driving, remediation and shoreline restoration. The Clean Water Act and the NPDES (National Pollution Discharge Elimination System) require Federal and state agencies to enforce laws to regulate point of source pollution. Turbidity barriers offer cost-effective turbidity control within a work zone. In addition, their use prevents violations that result in work stoppages, project shutdowns, and costly fines. Your project stays in compliance and on track while protecting the environment. IWT Cargo-Guard has been at the forefront in the evolution of turbidity barriers and silt curtains. We are a design innovator of durable turbidity barriers and silt curtains that withstand the harshest jobsite conditions. From skirt reefing lines to deep depth skirts or bed load baffle systems, we have a solution. We also offer Marine Accessories to ensure a successful installation. Please call us at 609-971-8810 so we can help you select the right barrier for your job. 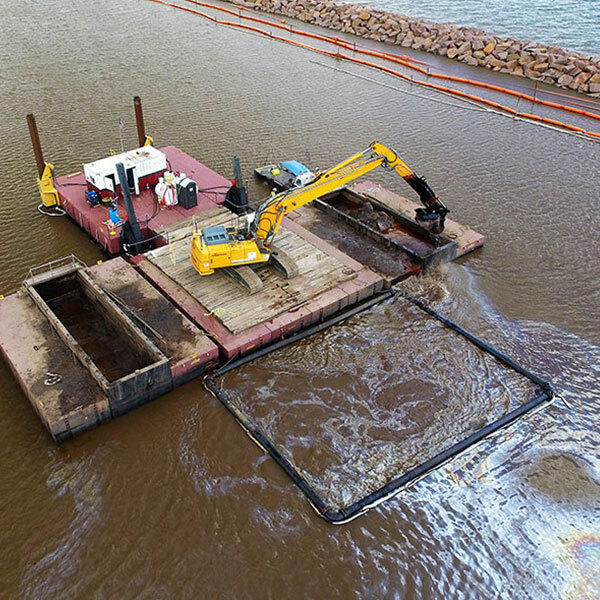 Turbidity barriers, also known as floating turbidity curtains, silt curtains, silt barriers or silt screens, prevent the migration of silt and sediment from a work site into nearby waterways. 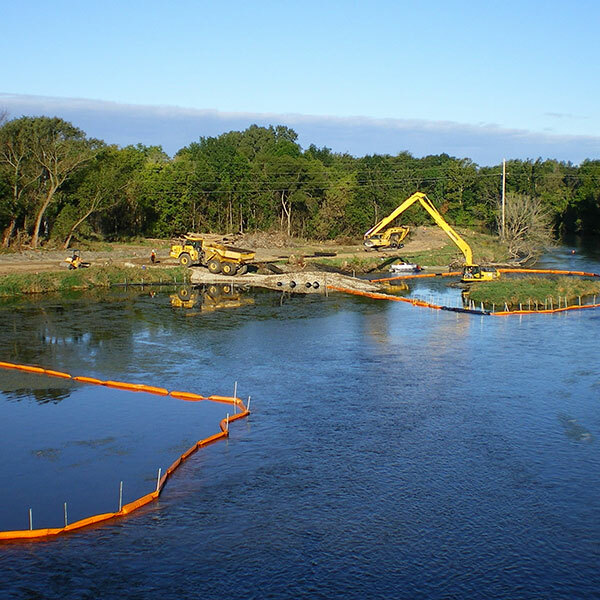 Applications include dredging, pile driving, remediation and shoreline restoration. The Clean Water Act and the NPDES (National Pollution Discharge Elimination System) require Federal and state agencies to enforce laws to regulate point of source pollution. Turbidity barriers are a cost-effective way to control turbidity within a work zone. In addition, their use prevents violations that result in work stoppages, project shutdowns, and costly fines. Your project stays in compliance and on track while protecting the environment. IWT Cargo-Guard has been at the forefront in the evolution of turbidity barriers and silt curtains. We are a design innovator of durable turbidity barriers and silt curtains that can withstand even the harshest jobsite conditions. From skirt reefing lines to deep depth skirts or bed load baffle systems, we have a solution. We also offer Marine Accessories to ensure a successful installation. Please call us at 609-971-8810 so we can help you select the right barrier for your job. The economy floating turbidity barrier is ideal for still or calm waters such as ponds, lakes, streams and ditches. The skirt is manufactured from impermeable lightweight reinforced PVC coated fabric with a standard depth of 5′. Section lengths of 50′ or 100′ are connected either by laced grommets or chain. Its compact design allows for easy storage while its affordability helps to meet a tighter budget. Type I DOT floating turbidity barrier is best for inland waterways such as ponds, lakes, streams and ditches. It specifically complies with the U.S. Department of Transportation (DOT) and other regulatory requirements for silt control in calm water conditions. Type I DOT floating turbidity barrier is available in both impermeable and permeable options. Type I works well in protected waterways with light wind or calm currents. 6” dia. flotation enclosed in impermeable reinforced PVC fabric, heat-sealed to be watertight and to keep the floats from shifting. Standard section lengths of 50’ and 100’ are joined together with lacing grommets. Type II floating turbidity barrier is designed specifically for locations with wind, waves, current and tidal changes. Inland coastal waterways, estuaries, rivers and tidal ponds are some areas this barrier is deployed to control silt, sediment and debris. Type II floating turbidity barrier is available in both impermeable and permeable skirt options depending on the water conditions. It is ideal for most regulated applications. Uses include silt and sediment control during dredging activities, shoreline restoration/ remediation, pile driving and rip rap installation. 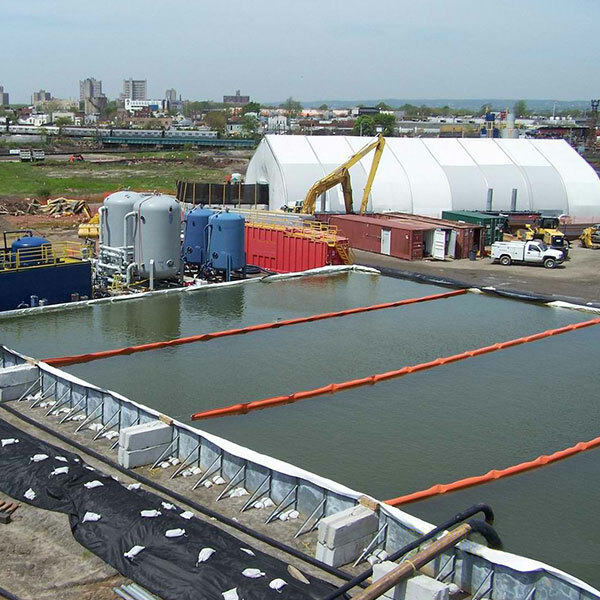 Type II DOT floating turbidity barrier complies with the U.S. Department of Transportation (DOT) and other regulatory requirements for silt control in calm to moderate water flow conditions. Type II DOT floating turbidity barrier is available in both impermeable and permeable options. Uses include silt and sediment control during shoreline restoration, remediation, pile driving and marine work along inland coastal waterways, estuaries, rivers and locations with tidal changes. 6” dia. flotation enclosed in impermeable reinforced PVC fabric It is then heat-sealed to be watertight. Float size increases as the depth of the skirt increases. Tool-free ASTM universal slide connectors or grommeted ends/tow plates. 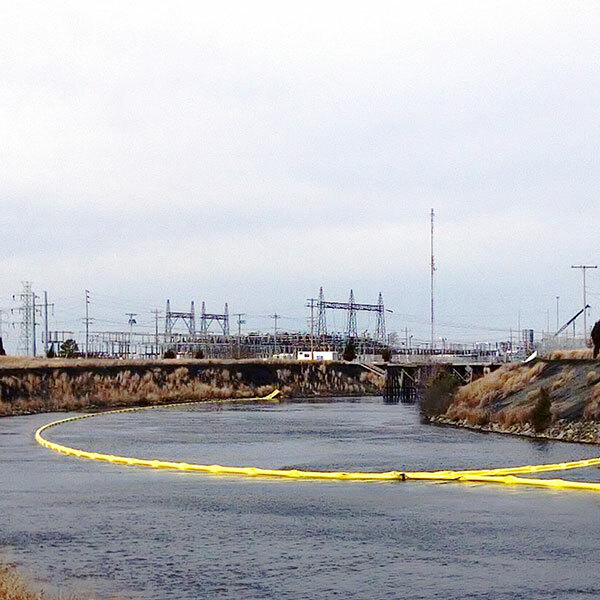 Type III floating turbidity barrier is our strongest barrier for containing silt and sediment in areas with high winds, currents and tides such as rivers, bays, and shorelines. They are robust curtains custom built to your project’s specific requirements. We select flotation size according to the skirt depth and utilize skirt materials that best match the application. Ideal for dredge containment, shoreline restoration, and demanding marine project sites. 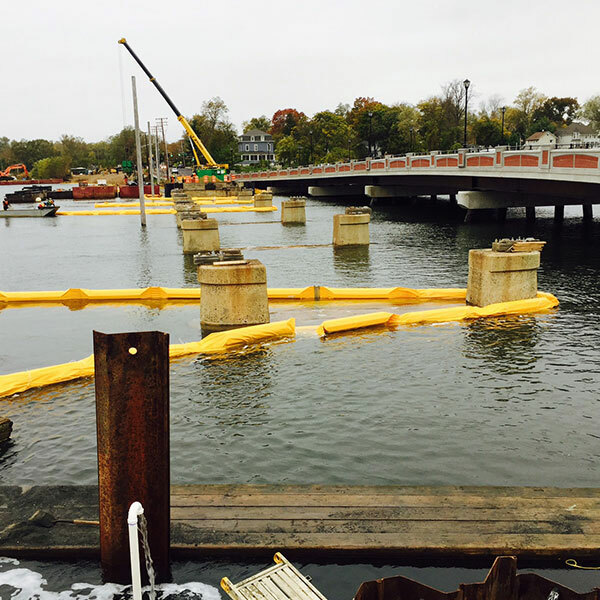 When project conditions call for a barrier that can handle adverse conditions and withstand the elements, Type III floating turbidity barrier will keep your project contained. Type III DOT floating turbidity barrier contains silt and sediment in rivers, harbors and tidal zones. It can handle conditions where flowing water is found and subject to winds and wave activity. Type III DOT turbidity barrier meets AASHTO-M288 specifications. Type III DOT silt curtains are manufactured with a permeable skirt that filters out silt and sediment effectively while allowing the barrier to withstand high flow conditions. Keeping your site in compliance with DOT regulation is of major importance. You can rely on our Type III DOT floating turbidity to perform. Staked turbidity barriers are excellent for controlling water flow at work sites that are adjacent to waterways. They are ideal for shallow water applications with little to no water or areas where stormwater activities raise water levels and elevate sediment in the water. Manufactured with impermeable reinforced PVC, finished along the seams and pre-pocketed every 4-6′ depending upon job site conditions. Barrier depths range from 2-4’. Optional ballast chain is available. Custom Floating Turbidity Barriers / Silt Filtration Curtains are popular with marine contractors and shoreline remediation companies. They are project-specific and based on the contaminant/sediment of concern. Baffle systems prevent the migration of silt and turbidity from predefined structures. They are flow control devices which increase the retention time and decrease the amount of TSS (Total Suspended Solids) within the water. This increases water quality while keeping you in compliance with regulation. We offer both floating baffle systems and bedload baffle systems. Floating baffle systems drop out sediments in the upper water column. Bedload baffle systems are submerged sections that reduce flow and capture sediments in the lower water column. We incorporate skirt materials such as permeable, woven polypropylene geotextile fabrics, or impermeable polypropylene and PVC fabrics. The baffles are tension cabled and ballasted continuously along the bottom. We select components for their corrosion resistance properties, UV resistance, chemical resistance and strength characteristics. This ensures that we construct the ideal baffle system for your application. When standard turbidity barriers can’t meet the needs of your unique deep water project site, IWT Cargo-Guard has a solution. We design custom deep water turbidity barriers that withstand rigorous site conditions to successfully capture fine sediments and contamination. Our deep water turbidity curtains can handle the substantial forces of weight, current, wind and wave activity. Our experience and expert manufacturing techniques ensure that your barrier will perform to your highest expectations. Moon Pool Curtains are hung from marine platforms configured into a containment cell that completely encloses a dredge site, capturing all of the contaminants / sediments within. The moon pool curtains are affixed to a platform and can be adjusted to adhere to the bottom during the dredge operation. Contractors may have their own unique approach to the exact curtain design for this application. IWT Cargo-Guard has been instrumental in the custom design of these sophisticated moon pool curtains and will work with you to design a curtain that meets your needs. A dredge barge silt curtain system mounts directly onto the side of a barge. It contains displaced sediment while limiting impact to nearby areas. This is especially important for hydraulic or mechanical clamshell dredges working in environmentally sensitive areas or busy shipping lanes. The system is also ideal for dredging projects that need the curtain to move with the barge. We can help you design a system to suit your needs. Regulatory bodies continue to introduce new marine mandates that contractors are to follow. As a result, fish exclusion barriers have become necessary when working in and around bodies of water. During certain times of the year, fish migrate in and out of specific areas to spawn or forage for food. When work cannot stop during these crucial migrations, a fish exclusion barrier is the solution. It prevents fish from swimming into the work zone, potentially harming them or their spawn. Fish exclusion curtains make constant contact with the bottom and are made of fine mesh/netting. This allows water to flow through freely while keeping large and small fish out. Jellyfish exclusion barriers are ideal for bodies of water where stinging jellyfish are a problem for swimmers. They keep jellyfish out while allowing important sea life to flow in an out of swimming or water activity areas. These barriers effectively keep an area clear of stinging jellyfish while allowing tourists, swimmers and beachgoers to roam without fear. We can manufacture our turbidity barriers with any of the options below. Please call us at 609-971-8810 so we can help you design a cost-effective barrier for your job site. We can install skirt reefing / adjusting lines on any of our turbidity barriers. They allow the barrier to adjust to the contours of the floor and changing water depths. Oil containment booms function to contain, control or divert oil spills. They perform especially well in ponds, rivers, inland waters, protected harbors, coastlines and offshore. Most of our oil containment booms comply with OPA-90, US Coast Guard-OSRO and ASTM F1523 regulations and/or guidelines. They are also available in a wide range of fabrics and sizes. Consider the type of waterway, wind, currents, tidal changes and deployment options when selecting oil containment booms. Please contact our office at 609-971-8810 . We’ll answer your questions and help you select the right boom for your project. Compact, portable, first response oil containment boom for still or calm water. We encase the 4” dia. foam flotation in reinforced PVC fabric and then heat-seal it to be watertight. We attach a 6″ depth impermeable reinforced PVC skirt below the float and ballast continuously along the bottom. Section lengths of 50’ or 100’ join together with lacing grommets or tool-free aluminum universal connectors. Economical, general purpose oil containment boom for inland, protected waterways with low current velocity. We encase the 6” dia. foam flotation in reinforced PVC fabric and then heat-seal it to be watertight. We attach a 12″ depth impermeable reinforced PVC skirt below the float and ballast continuously along the bottom. An optional 5/16” dia. PVC coated galvanized aircraft cable adds tension and strength to the boom. Section lengths of 50’ or 100’ join together with tool-free aluminum universal or ASTM F-962 connectors. Heavy duty oil containment work boom for harbors, marinas, rivers, and the open ocean. We encase the 6” dia. foam flotation in reinforced PVC fabric then heat-seal it to be watertight. We attach a 12″ depth impermeable reinforced PVC skirt below the float and ballast continuously along the bottom. A dual 5/16” dia. PVC coated galvanized aircraft cable on the boom adds strength and increases drag force for longer towing configurations. Section lengths of 50’ or 100’ join together with tool-free aluminum universal or ASTM F-962 connectors. Durable, heavy duty oil containment boom designed for repeated deployment in rough seas and open water. We encase a larger 8” dia. foam flotation in reinforced PVC fabric then heat-seal it to be watertight. Below the float we attach a 16” depth impermeable reinforced PVC skirt and ballast continuously along the bottom. In addition, a dual 5/16” dia. PVC coated galvanized aircraft cable increases strength and durability. Section lengths of 50’ or 100’ join together with tool-free aluminum universal or ASTM F-962 connectors. 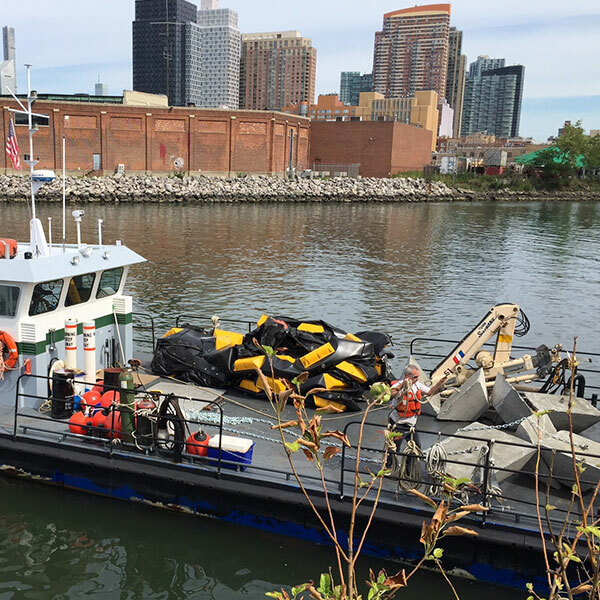 Debris/Trash Boom contains floating trash, plastic, flotsam or free product by corraling it in a designated area to be cleared from the surface. When working in and around waterways, site trash or excavation debris can make its way into the water. 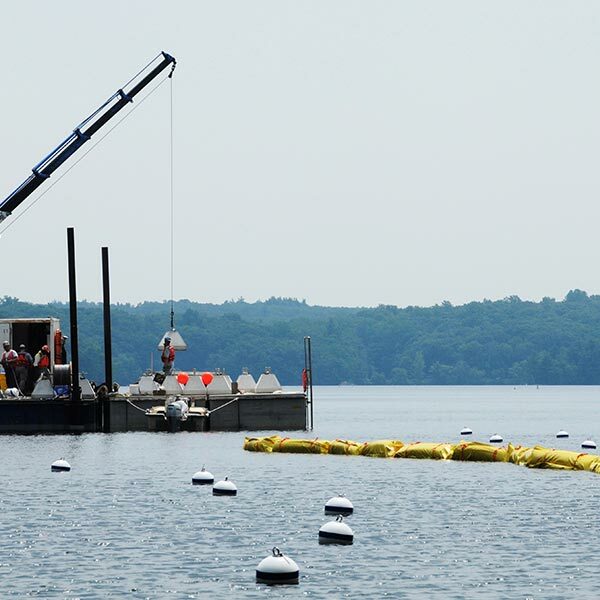 Floating debris boom is the perfect solution to staying compliant. IWT Cargo-Guard will help you design and implement a successful configuration for use in the field. Whether it is a custom design or stock boom off the shelf, we have the solution for your site. Seaweed Boom helps to keep seaweed and sea grasses away from beaches and resort areas. Storm events, wind and tide drive seaweed and grasses towards these areas, rendering them useless until they can be cleared or washed back out to sea. It is no longer necessary to wait out the tide. When the seaweed boom is in place and properly anchored, the benefits of fending off the encroachment of unwanted seaweed are clear immediately. IWT Cargo-Guard can assist you with your seaweed problems and provide you with options to combat the issue. Marine accessories such as anchoring systems, buoys and marker lights are essential for the installation and maintenance of floating turbidity curtains and containment booms. IWT offers a complete line of high performance marine accessories for seamless deployment, anchoring and protection to ensure a successful containment installation. Please call us at 609-971-8810 for more information. We’ll answer your questions so you can select the right marine accessories for your project. Tidal changes, current flow and direction, prevailing winds, bottom composition, and water depth are important considerations in the design of a proper boom anchoring system. When deploying in navigable waters, consult the U.S. Coast Guard or local authority. We can also pre-assemble our anchor sets with rope and chain to ship with turbidity barriers or containment booms. Metal Posts/Poles: A good option for shallow water or tidal areas. Cabled rings with floats can also be utilized to allow the barrier to rise and lower. Mushroom Anchor: Stockless with a cast iron bowl at the end of a shank. It works especially well for loose or sandy bottoms. The anchor gradually sinks deeply into the bottom and has tremendous holding power once embedded. Danforth Anchor: Lightweight with long, narrow, pivoting twin flukes at the end of a long shank. The stock is attached to the rear of the flukes, which engage quickly and bury the anchor completely under heavy loads. Pyramid Anchor: A one-piece cast iron anchor that rapidly penetrates the bottom. Its shape and large surface area create powerful suction that increases the deeper it sets. Works especially well in hard, rocky or sandy bottom applications. Marine Earth Anchor: A percussion-driven earth anchor providing an alternative to traditional anchoring methods. It performs especially well in displaceable ground conditions typical in marine applications. It is also lightweight, corrosion-resistant, and easy to install with powerful holding capacity. Mooring Buoys: A simple foam-filled sphere with hardware at the bottom for attaching lines. Typical sizes range from 12″ diameter to 24″ diameter. Marker Buoys: Mark the placement of anchors. Also known as pick up buoys. They typically have a long mast with a flag or radar reflective tape. Considerably smaller than a mooring buoy so that under heavy strain it will submerge before it can raise the anchor. Lighted Buoys: Required in navigable waterways. Prevents vessel traffic from entering boomed areas. Topped with a battery-operated flashing light. A photo sensor turns it on at dusk and off at dawn. Colored lenses also available. 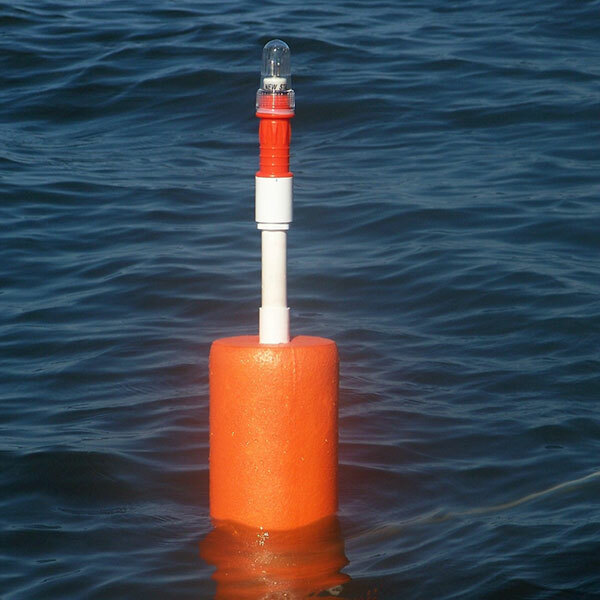 Lighted buoys typically replace marker buoys. 9000X Series: Battery-operated, bright pulsating light. Flashes 30 times per minute. Visible up to one mile. Available in red, amber, white or green. Mounts on buoys as well as stand-alone floating masts. Sea-Light SL15: A LED solar marker light. Preset flashing patterns as well as steady on. Mounts on a buoy and is visible up to one mile. Available in red, white, yellow or green.